Boy George and Culture Club, the B-52's and Tom Bailey of the Thompson Twins are joining forces for the Life Tour which will travel across the U.S. throughout the summer and into the early fall. Opening on June 30 in Tampa, FL, and running until October 6 in Fresno, CA, the tour is hitting over forty cities and even more are to be added. With seventeen top twenty songs in the U.S. between them, the three artists were among the most heard on radio during the 80's. 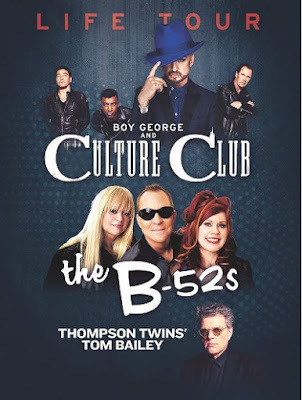 Boy George said "We put together an amazing show that is going to be filled with hits and fabulous memories. We know it will be hands down this summer's best night out." For ticket information, check with your local venue.